As mentioned above, multiple lists contained the information we needed to summarize. Our goal was to make a pie chart detailing the number of engagements by type. For our example, we’re going to aggregate the data from three different lists. The first list, called Empire Engagements, is a list of all engagements of the type Empire. It contains the title of the engagement, as well as the current status and leader of the engagement. The second list, called Rebel Engagements, is a list of all engagements of the type Rebel. It also contains the title of the engagement, as well as the current status and leader of the engagement. The final list is called Independent Engagements. Like the previous lists, this list contains the title, status and leader of the engagement, but it also contains an Engagement Type column. The Engagement Type column is a choice column that allows multiple selections. Two options exist for retrieving the data from SharePoint for our project: Representational State Transfer (REST) and the Client-Side Object Model (CSOM). While CSOM has been around since SharePoint 2010 and is currently better documented around the web, the preferred approach is to use REST as it’s a standard that can be understood by multiple technologies. Certain tasks require CSOM as they can’t be performed via REST, but the simple retrieval of items isn’t one of those tasks. Although querying the data isn’t problematic using the pattern above with one list, it quickly becomes unmanageable when multiple sources of data are called. In cases where we need to gather information from three different lists, each additional $.ajax call would need to be made inside the previous call’s success function. In order to prevent "spaghetti" code, we turn to the concept of promises or deferreds. Additionally, this code contains some refactoring through the use of a generic function to retrieve data from lists via REST calls. Now we’ll discuss the creation of the pie chart within our dashboard solution. As mentioned above, we’re using jQuery promises — specifically the when, done, fail pattern — to retrieve our data via REST. 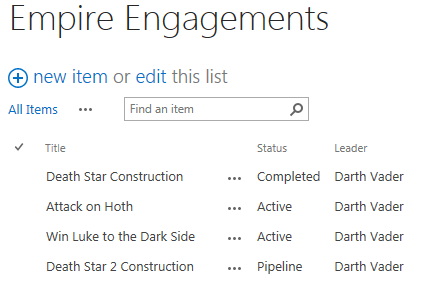 We’re querying data from the Independent Engagements list, the Rebel Engagements list and the Empire Engagements list. The data is returned respectively into the engagements1, engagements2 and engagements3 variables. We’ll store these values in the countArray variable. 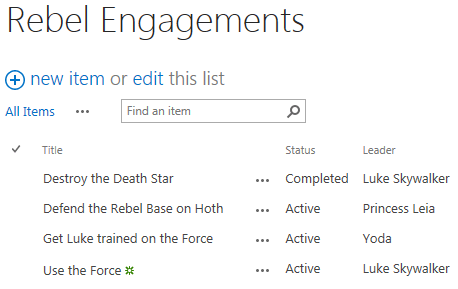 Retrieving the data from the Rebel Engagements and Empire Engagements lists is easy. We simply need to count the number of results retrieved. The following lines of code take the counts and put them into the countArray. Retrieving the data from the Independent Engagements lists is a little more difficult as we need to determine which category (or categories) the list item is assigned to. To temporarily hold the data, we place the data into a temporary data array called dataArray. This will simply be an array of all of the values — we’re not worried about counts at this point. This works perfectly for single choice or single value items, but in our case, we’re using a choice column that allows multiple values. This information is returned as an array of data. In order to retrieve each selected choice, we must loop through the values. This is done in the for loop using the j counter variable. Now that we have the data in the format we need, we can create the chart. The chart will display in the engagementPieChart div on our page. Next, we’ll discuss the creation of the bar chart within our dashboard solution. We’re using jQuery promises — specifically the when, done, fail pattern — to retrieve our data via REST. We’re querying data from the Rebel Engagements list and the Empire Engagements list. The data is returned respectively into the engagements1 and engagements2 variables. To temporarily hold the data from the Rebel Engagements and Empire Engagements lists, we place the data into a temporary data array called dataArray. This will simply be an array of all of the values, not worrying about counts at this point. Keep in mind that the above code only works for single choice or single value items. The categories are now in the xCategories array, and the counts are in the seriesData array. Now that we have the data in the format we need, we can create the chart. The chart will display in the engagementsByLeaderChart div on our page. Finally, we’ll discuss the creation of the stacked bar chart within our dashboard solution. As mentioned in the previous sections, we’re using jQuery promises — specifically the when, done, fail pattern — to retrieve our data via REST. We’re querying data from the Rebel Engagements list and the Empire Engagements list. The data is returned respectively into the engagements1 and engagements2 variables. The first array holds the leaders' names or categories, which will be displayed on the y-axis. The second array contains the status value (Pipeline, Active, Completed) within our chart, along with an array containing the values corresponding to the leader names. In order to hold the data we’ll retrieve, we create a function that contains the leader name, status and count. Then we retrieve the data and place it into an array, incrementing the counts when both the leader and status are matched. Then, in order to have a place to update the counts, we create the complex structure of objects and arrays needed for the stacked bar chart. As a start, we’re creating all of the counts as zero so we just have a placeholder for each value. As the final step of manipulating the data, we loop through all possible combinations of leaders and status values while counting up matching records in our data retrieved from the REST calls. This data goes into our seriesData array. Now that we have the data in the format we need, we can create the chart. The chart will display in the engagementsByStatusChart div on our page. For more details on the parameters and options used to create the chart, look at the Highcharts API reference at http://api.highcharts.com/highcharts. This article originally appeared on May 7, 2013.